Early goals are so important. The US has had this problem for most of the games they have lost this year: Costa Rica, twice to Brazil. The turning point in a game that was close to being one of the biggest upsets of all time was Luis Fabiano's goal less than a minute into the second half. You give Brazil another 44 minutes and you are asking for it. A little overconfidence? Maybe. It's a hard lesson to learn but remember this.... 3-0 versus Egypt and 2-0 versus number 1 Spain. Losing 2-3 to Brazil in the final isn't so bad. They played with spirit, courage, grit, and goals. Two of them. This is a star-studded Brazilian side that boasts Luis Fabiano, Kaka, Robinho, Dani Alves, Luizao, Elano, Julio Cesar. In fact, the US should probably have lost by more. A 5-2 would not have been surprising. A 4-2 would have been true if that goal counted that Howard miraculously saved. The ball went in. Replay shows it did. No doubts there. So what do we take away from this experience? Close down in the early minutes of a game or a second half. Be smart in defense and don't give up unnecessary fouls that can lead to dangerous set pieces. No red cards, please. Bradley's absence today could have made a difference with some of the passes Kljestan and Clark wasted. His eye for goal may have changed things too. Sticking Torres and/or Adu could have brought something else to the game. At that point why not try your aces? Still, a historic tournament. Now we regroup, re-energize with a deeper pool of players: Ching, Edu, Jermaine Jones, Cherundolo, Hejduk. I'd like to see Edu-Bradely in the midfield. There's still plenty of time before South Africa 2010. We must still qualify. Now we have the experience to do well into the tournament, getting those wins necessary to advance and playing smart to dismantle a top team's offense. Fabiano's goal early in the second half undermined the US's style of play. It opened up the game for Brazil since the US had to look for an insurance goal. Hunkering down and hoping/praying to stay up on the scoreboard isn't quite enough. Possession in the midfield, Michael Bradley's strength, is what was missing in the second half. But we played great anyway. International summer + summer travel by yours truly = less frequent attendance stats. Sorry, kids. Things are interesting, though. People show up to games even though their national side is obviously playing internationally. I can't say I blame them. I would love to go see a game live after watching a good game by the USA. I did this way back in '98 after a world cup game. I attended the superclasico Emelec-Barcelona of Guayaquil. Score was 2-1 after penalties. Kaviedes scored. I think stats will look much more interesting once Goldenballs comes back after July 15. Thing is, that's probably when the next major update will happen. 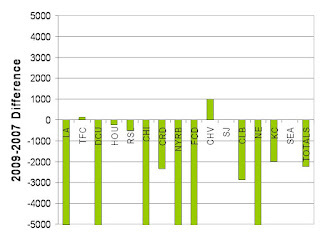 Meantime, updated plots are on the right column. Crank up those vuvuzelas. And this is the team we were doubting after the Brazil match? Where's the Rossi hate now? Doesn't he wish he could be on this US team? There were so many positives today and not enough praises for what could be an historic moment in US soccer history. Never mind what happens on Sunday. The win today cements the US Soccer Federation and the American game in general as a new force in the world scene. There is a long way to go still, yes. But somehow a US presence in the latter stages on the World Cup within the next decade are no longer the stuff of dreams. Cheers, boys. Thanks for making us dream. Thanks for earning our game the respect it deserves. This is an incredible triumph, regardless of what the outcome may be on Sunday. PS: That was not a red for Bradley. 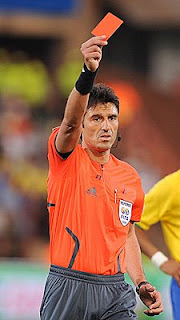 Refs are being a bit dubious in this tournament with the US. He will be missed in the final. Nobody likes to play the numbers game. Usually when you play it it doesn't go your way and you are left saying, "well, we almost had it but..." Not today. The score was USA 3 - Egypt 0. Wait, wasn't this the same Egypt that beat Italy in the last game and that almost tied Brazil in the first game? Wasn't this the same USA that got humiliated in the second half by Italy and that got outclassed and out played by Brazil? Yes and no. Yes, Egypt had an amazing game against Brazil putting their chances away and conceding a late goal to a Kaka penalty. Yes, they blanked Italy and the Azurri were stunned by the African champs 1-0. But not today. Injuries count, yes, but you have to keep your composure in international football or you will get burned. And what about USA? They played a great game against Italy until Clark was sent off. They held their own until the spaces in midfield opened up for two sensational long range shots from the "Rossi" boys. Things may have been different with Clark on the pitch. Against Brazil the US came out muted and got burned with an early goal (same thing happened against Costa Rica and Honduras). Brazil went up by 2 goals by halftime and Kljestan took the US down to 10 men with another silly foul. Brazil 3 - USA 0. But not today. No red cards. No silly fouls. That made the biggest difference. That plus heart, desire, teamwork, and yes, a bit of luck. Redemption? Yes. Many out there have been calling for Bradley (the coach) to step down. Others say the US is just not that good. Many of us were somewhere in between. Hoping for the American spirit to shine through and show why the sport has evolved so much in our country. Today Jozy showed why he can cause problems for the other team, why Landon Donovan is an amazing player, why Michael Bradley belongs with the big boys, why Onyewu and Spector are constants in the back, why we have speedy forwards like Davies aching to show off, and why Dempsey is a world class player. He coughed up a lot of balls and was miscued in a lot of plays. But Bob Bradley was correct when he said that the reason he kept him a starter was because he alone has moments of brilliance that no one else can bring. And wow, that was such a moment of brilliance. It's up there with Pele's header in 1970 against Italy and Romario's versus Sweden in 1994. Yes, I know those are two amazing players but consider this.... The situation was important, the result was extraordinary, and the finish impeccable. And in the end Italy lost to Brazil by the same score, 3-0. That was the magic number the US needed and that's what they got. Up next is Spain, and if you're gonna go down you, you should do it against the best. That's why we have dreams, no? Red cards, red cards, red cards. A 3-0 loss against a classy, albeit not awesome Brazil. What went wrong? Everything. If the game against Italy was a steal (not a red card for Clark, no reds for two Italian offenses) and a dignified game for most of the squad, then today's game made us look more like New Zealand or Canada in the last Confederations Cup. DeMerrit and Bornstein were often beaten whilst Spector (he should keep the job) and Onyewu held their own. I'm not sure why B. Bradley would start Beasley and Kljestan in favor of Feilhaber, Torres or even Adu. He had his reasons, and although I thought Beasley had a chance to redeem himself, he once again showed why his place with the nats may be expiring. I'm also questioning players' ability to show off for European teams. Besides Landon Donovan and Oguchi Onyewu I don't think the rest of the group merits a second look. Let's hope the Egypt game goes better for our national team. Pride alone is at stake. No red cards please. For once, as much as it pains me, I have to side with Trecker. I won't get into too much description of the game. For that you can go here or here. Instead, I want to focus on the central midfield and what went wrong. First, that was not a red card on Clark's challenge during the first half. If anything, a Benny Feilhaber foul in the second half merited it much more. Second, there was at least one foul that deserved a red if Clark's was deemed so offensive.. An elbow to Donovan's face that only got a yellow. Donovan comes up big again and delivers a scintillating penalty. But the upset was not to be. An inspired supersub (and US born) Giusseppe Rossi ties it up from a distance with a splendid shot that outmatches Howard. This started with a careless play by Feilhaber. The second goal by de Rossi was also a long shot. What do these two goals have in common? They were generated by poor passing in the middle of the pitch. That's where Ricardo Clark (red card) would have been. That's where Mastroeni and Christ Armas used to shine and Edu would work wonders. I'm not saying Italy couldn't have won anyway but we have to take into account that the US defense, despite a few misskicks, was pretty stout except for these long-range shots. Yes, let's remember that Italy are the world champs and that they have the luxury of having players like Luca Toni and Rossi on the bench. And the road does not become any easier. Up next is mighty Brazil. The "caraninha" fought hard for a 4-3 win against Egypt in a game that the "pharaohs" played extremely well and perhaps deserved better. So what happens with Clark's omission on Thursday? This will be a very difficult decision for Bob Bradley. He needs someone to partner up with Michael Bradley in the middle of the pitch to break up plays from the opposing team. Torres, Kljestan and even Beasley are options here. I would slide Beasley into the middle in favor of Kljestan or Torres due to his experience. Feilhaber is an option too but his skills are more creative and offensive. The same goes for Kljestan. Finally, there's the Torres option. The Pachuca man has shown effective ball-possessing technique. This is key when facing a squad like Brazil. Aside from the devastating hole in the midfield due to a huge misscall by the ref, I thought team USA played courageously and with a certain amount of attitude. Get your DVRs/Tivos ready. It's the best of the best (sort of) international teams on the planet facing off in South Africa for the FIFA confederations cup. This competition pits all the winners from all the confederations against one another plus the world champs and the host country. All complete squads. All new stadiums. Games will show on ESPN2, Galavision.... and the US is participating. Italia: Pirlo, Rossi (American-born), Cannavaro, Gilardino, Zambrotta, Iquinta are some of the highlights from the Italian squad. Lippi is once more the coach after Donadoni crashed out of the Euros last year. Expect gritty, defensive-minded soccer from the world champs. A rematch of World Cup 1970 and 1994 finals against Brazil in group play (next Sunday) should be fun to watch. Brazil: Kaka, Robinho, Pato, Julio Cesar, Luis Fabiano are all in the mix. Ronaldinho is out for this one. The selecao is looking for more silverware after a disappointing Olympics last summer. This squad only seldom fails to entertain. USA: The biggest test for the US before the World Cup (assuming they make it). What better than putting them with Italy and Brazil? Getting out of this group would be amazing. They fought for the spot in this competition against Mexico in Concacaf's only meaningful Gold Cup two years ago (for some reason they have an inconsequential one this summer too). Expect Spector and Bornstein to raise their stock and many other players looking to showcase their talents in the world's biggest stage yet. Jozy, Casey, Adu, Kljestan, Bradley are all looking to continue impressing. Egypt: I wish I were more familiar with this squad. All I know is that they are struggling at the moment in world cup qualifying in a group that includes Algeria and Zambia, both of which have not advanced to the tournament for the past two decades or ever. Egypt last played in a world cup in 1990 but has repeatedly won the African Cup of Nations against more accomplished world class teams like Nigeria, Cameroon and Ghana. Spain: This is an extremely talented squad, winners of last year's Euro. It includes amazing players like Torres, Iniesta, Xavi, Xabi Alonso, Puyol, David Villa, etc. Whilst their back four may not be as strong as other teams like Italy and Brazil, their midfield can break up any team's attack. Spain is also undefeated since before the Euro competition. I pick them as winners. New Zealand: After Australia joined the Asian Football Confederation (AFC), New Zealand was left in sole possession of Oceania. I can't see Fiji or the Solomon Islands beating them out. The "kiwis" will have a play-in game against the 5th AFC team for the world cup. Don't expect too much from then at the CC. Iraq: AFC champs and representatives. Bandwagon team for many. They had a nice run at the Olympics in Athens but should not pose any trouble to Spain or South Africa. Sout Africa: I'm picking this team to go through from the group stage simply because they are the home team. Not much more after that. The Bafana Bafana are nowhere near as strong as their inaugural squad in 1998 (once Apartheid was abolished they were allowed into FIFA). Pineaar (Everton) is a bright spot. There you have it. 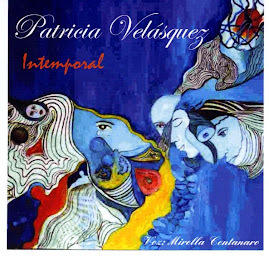 It all starts tomorrow so start enjoying a nice prelude to the World Cup 2010. Mexico 2 - Trinidad & Tobago 1. Meantime it was 1-0 for Honduras in favor of El Salvador. So is 2-1 for Mexico really that bad? Did the team play so horribly? Long answer is "no" with a "but" and the short answer is "yes" with an "if." 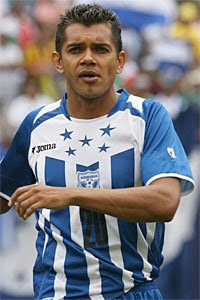 The Chicago Fire midfielder/forward Cuahutemoc Blanco did his duty and was easily the best player on the Mexican side. Guardado committed a few errors but was still strong going forward and creating chances. The Castillo-Franco tandem up top was great at the start of the first half. The first goal by Mexico was in the first minute of play with a nice give-and-go between Castillo and Franco. Throughout the game Mexico created plenty of chances but luck was not on their side. It could easily have been 6-1 or higher if it wasn't for the Trinitarian 'keeper. The back line looked shaky at times, yes, but they also went forward and created chances. I also don't think the Mexican FA is as much to blame as the press itself. Look at what happens when teams win at home. USA beats Honduras after coming from behind 2-1 and its called "courageous" and "a step in the right direction. El Salvador beats Mexico and they are "heroes" and "historic." Ecuador beats Argentina and it's a "justified win" because they wanted the game more. Now you have Mexico win at home and looking "deplorable," "uninspired," etc. The players were upset with these comments. They put their heart and soul on the field. I could see that. No one wants to "not win." That's ridiculous. And what about the "Futbol Picante" crew on ESPN Deportes calling Lavolpe's team as "much better" than the current squad when this particular group was supposed to be the "golden generation" after winning an U-17 tournament against Brazil by 3-0. We should know that when the youngsters play all bets are off. Sanchez and Eriksson were not given enough time and were ousted prematurely as many a coach in the Americas. Now you have "el Vasco" Aguirre and you lose abroad. Same difference. The same thing happened with Argentina after going down to Ecuador. The press was furious and looking to decapitate players' and managers' heads. We know Ecuador is a much better team these days, even if they are on the outside looking in at the potentially "qualified" teams in South America. The team has been to two successive world cups. So, with that said, I ask the press to stand down. Reflect. Accept the consequences that these days world football isn't as "black and white" as it used to be. Support your local squad when they achieve a win or good result. 3 points puts Mexico back in the hunt. They will almost certainly beat the US and any other team at the Azteca... and they, along with Argentina will qualify for the world cup. Two superb goals against one of the most accomplished national teams in the world. That's what Ecuador needed to get back in the hunt for a place in next year's world cup. That is what they got. After an inspired 2-1 win at Conmebol's current whipping boys Peru, the zero latitude country needed another win to put it once more within the top 5 of the South American conference. An awesome shot from a distance by Ayovi (made Sportscenter on ESPN Deportes, Fox Sports en Espanol as the one of the top goals of the week), and another great shot from Pablo Palacios sent Maradona, Messi, Tevez and company packing. The "gauchos" have a lot on their hands still. They are only 2 points clear of Ecuador with 4 games left. Yes, I was pessimistic on a previous post when Paraguay and Brazil tied Ecuador in Quito on successive qualifiers. I thought the road was over. Not yet. Ecuador has a couple of cards left and although we may all irk at the thought of playing the numbers game, this time we don't really have a choice. In a perfect world the team would win all its remaining matches. Instead they are now pitted against direct rivals (Colombia, Uruguay), away to ailing (almost eliminated) Bolivia, and a final match in Santiago de Chile. 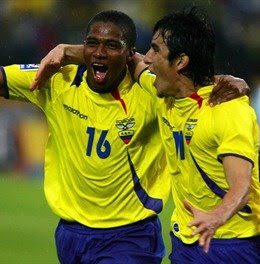 Any rescued points from Colombia on game 1 (even 1 point) keeps the team tied for 5th (play-in against Concacaf's 4th). If Peru beats Uruguay things are even more interesting because Ecuador would be in sole possession of 5th place. Also, at this point we pretty much want Chile to win all its remaining games except the final against Ecuador. Paraguay should beat Bolivia and Argentina-Brazil is a free-for-all. Two weeks in one update... International dates are gaining momentum and attention these days. Lately RSL has somehow come back to have two near sellouts in their home showings. Not bad. Right now I'm watching a very discrete game between Dallas and San Jose at the Pizza Hut Park. Empty seats abound. Looking back to a difference between current attendance average figures against the final figures on 2007. It's basically the same pattern as 2009-2008 difference except for Chivas, which has gained momentum recently both on and off the pitch. A nice turn of events, no? It was a nail biting experience. Down in the first 5 minutes at home versus a rising Honduran team in front of an unfriendly crowd. Wait, I thought this was a home game. Nope. Not when you have your players play an important qualifying match in a major city, easily accessible, to a crowd with significant presence in the United States. It was 0-1 on the scoreboard in Chicago. But this was different. No Marvell Wynne to leave open spaces, no Beasley in an unnatural left back position, no Bradley or Torres in midfield and, again, no Ching. Instead we had Conor Casey (top scorer in MLS at the moment and with Bundesliga experience) with Altidore. Spector did his job at right back (although the position is still up for grabs), Bornstein cleaned it up on the left side and Clark was surprisingly strong in the defensive midfield. As the first half wound down it was a Donovan penalty for a well deserved tied score at halftime. Then came the spark of Benny Feilhaber (Aarthus, Denmark), substituting an absent Mastroeni. Things started to roll again. 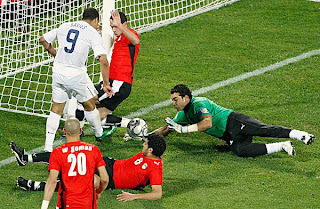 I was cheering for Benny to score another stunner in Chicago, as he did in 2007's Gold Cup in the final against Mexico, but instead we got tremendous possession and play as a creative role in the middle of the pitch. I highlight him because of all the bad press he has gotten for the past 2 years after two injuries and bad form. He just plain showed why he deserves a spot in the current squad when veterans like Mastroeni are down or yellow card fears impose a change on the field. Benny was there for it and should remain in contention for a supersub at worst. 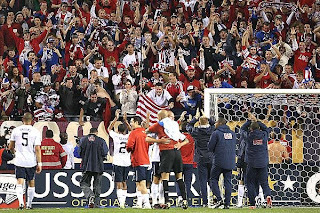 Finally, let's rewind to the game winner... A corner kick, always an important weapon in the Americans' arsenal, a re-centering of the corner by Dempsey, and an opportunistic head-dive by Captain America Carlos Bocanegra. Never mind the fact that he could have been injured by the defender, or the fact that he actually did get injured later in the game. It was a goal. The (American) crowds went wild and South Africa looked a step closer. More so with Mexico's defeat at El Salvador. The US is now in second place with 10 points, 2 behind Costa Rica, 5 clear of 3rd place El Salvador. This qualifying round will be down to the last game, it looks, and there may still be a game against a South American team for the final play-off. This could be true for Mexico or even the US. Ouch. 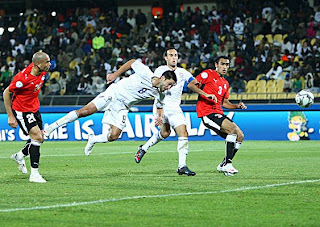 The US national team continues its qualifiers for a berth at the 2010 World Cup in South Africa against Central American powerhouse Honduras tomorrow night (ESPN, Galavision 8PM ET). 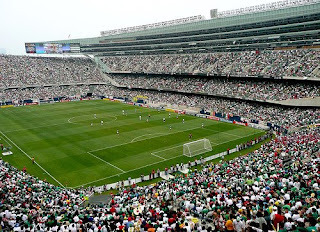 If Costa Rica's Saprissa Stadium tested the American's composure in the face of fans, turf and history, then Soldier Field will show them what it's like to play against an away crowd on their own home turf. 50,000+ seats have already been sold. I'm also told that it will be 70% Honduran. I wonder why they decided to play in Chicago when they could have done it in Foxborough, Seattle or even Columbus. In Columbus we had at least 60% American. I hope that 70% figure is wrong. What else is at stake here? Everything. Bradley's job as coach, the nats' summer form ahead of the Confederations Cup and the Gold Cup, and possibly even the coveted place in the World Cup. This game is now more important than the Mexico game in February. Wednesday's loss has made the need for a "W" much more important. Reading through more important blogs, I've noticed what is certain. The team we saw on Wednesday night will never be on the field again. Wynne is not ready for the right back position and Beasley cannot be a defender at left back. Bring on Bornstein or Hejduk (if healthy) and please please put Spector on the right. Also, no Michael Bradley after a soft yellow card in Costa Rica. It is now up to Torres and/or Kljestan to step up along with Clark/Mastroeni. I prefer Kljestan and Clark (I know I've been hard on the Dynamo player in the past but his athleticism will bring certain credibility to the position in the midfield). Now to the attack. No Ching due to injury. I'm tempted to bring Donovan to the forward position again, sliding Beasley into his normal left wing. Hopefully Dempsey will show up to this game. God knows we need him more than ever. Altidore should stay up top as well. Conor Casey and Charlie Davies are nice options off the bench, as is Adu. Now about the Catrachos. 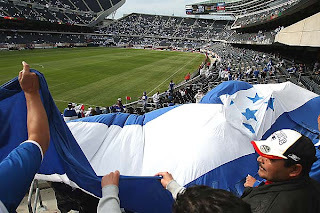 Honduras actually is the last of the CONCACAF teams to beat the US on home soil. This was back in 2001 during a game that got interrupted by a stupid invasion of Afghanistan. It was 3-2 at RFK. The Central American team has the likes of Pavon (briefly with the Galaxy), Amado Guevara (Toronto), Wilson Palacios (Premier League), David Suazo (Inter Milan, Benfica). A tall order? Yes. A win? A must. Will the national team show up? They did against Mexico and Trinidad. We hope they show up in Chicago tomorrow as well. No predictions... I don't want to jinx it. Bring it on. 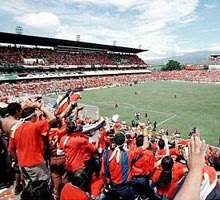 Tomorrow night Costa Rica will face off against the United States national team in a key World Cup qualifying match. Perhaps one of the more intimidating venues throughout CONCACAF, Costa Rica's Estadio Saprissa will test the US national team harder than Wembley itself. Why? What's at stake. This isn't a friendly on an international date. It is a game that can decide the future of both teams, change their status in the region, and put pressure on other teams like Mexico and Honduras to perform at their highest potential to evade exclusion from the World Cup or the dreaded playoff with CONMEBOL's 5th place team. This is also a test of mental fitness for the players. It's important to note that the current crop of players is comprised of experience (Ching, Donovan, Bocanegra) and youth (Bradley, Altidore, Davies). Their focus on the game, understanding with each other and possession of the ball will be the key to this match. Coach Bradley has picked Mastroeni and Ricardo Clark as possibilities for the midfield due to their experience (especially Mastroeni) with Costa Rica. Maurice Edu and Frankie Hejduk will miss the match due to injury while players like Pearce and Kljestan have recently fallen out of favor with the national team as well as their respective clubs. The back line will likely be comprised of Bocanegra and Onyewu in the middle, Spector (right) and Beasley/Bornstein (left). The left flank would be the most dangerous spot, especially if the coach decides on a more defensive stance with a lone forward (Ching). I pick Torres, Bradley, Donovan and Dempsey in midfield with the Ching/Altidore tandem up front. From what I hear, the pitch is artificial turf laid 5 years ago and with significant wear from games and weather. About the Ticos. 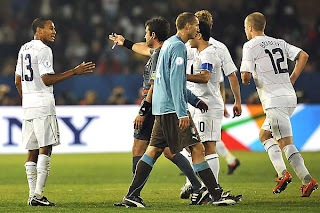 I won't go into too much detail when it comes to previous matches with the US in world cup qualifying. For that you should look at this great story. To me the Ticos represents the best from Central America from a historical perspective. They have had near continuous presence in the ecumenical event for all tournaments in the present decade. In 1990 they had an excellent run that took them to the round of 16 after beating both Scotland and Sweden. Those were the days of "el Conejo" as the goalie. 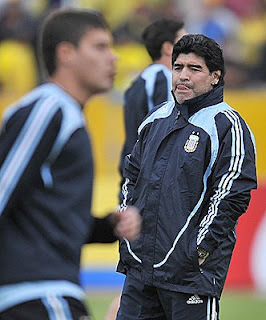 Their recent form in the World Cup has been less than stellar with blowout losses to Brazil (2002) and Ecuador (2006) that excluded them from the round of 16. 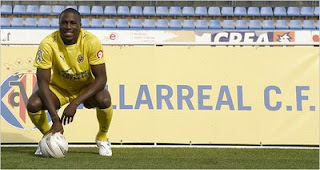 Current stars include Segares, Navas, Furtado, Ruiz. All capable players with a long line of success. My prediction. Costa Rica 2 - USA 0. This should be considered as one of the matches the US team can count as a loss. Any points rescued from this match would give the US significant advantage going into Saturday's match against Honduras in Chicago. Tomorrow's game is on ESPN live at 10PM ET. Right before the next international FIFA date (starting Wednesday with Costa Rica - USA), we already have significant seismic rifts in Europe. 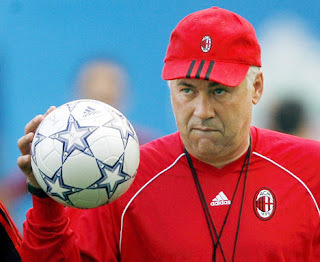 Carlo Ancelotti, the 2 time Champions League winner with AC Milan, architect of David Beckham's move to the Italian club, has signed with Chelsea as their head coach. Becks may want to recheck his future after this. 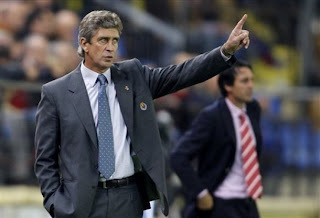 Elsewhere in Europe we're hearing that Manuel Pellegrini has left his post as Villareal manager in Spain to coach none other than Real Madrid. This is an interesting move for a well-traveled and successful coach that won titles with River Plate, Liga De Quito, San Lorenzo, as well as 5 important years with the "Yellow Submarine." A void is now left for Jozy Altidore's current team, putting the young American's future at the club in question. How will the new manager use Jozy, if at all? Will he be loaned out to a Adelante team again, perhaps to a team in the EPL? We must remember that it was the Chilean's coach that brought him from MLS and who decided he needed more acclimatization to La Liga. His plan backfired when Xerez refused to play the skillful American. It's not only Jozy that has an uncertain future. Freddy Adu is waiting to see what the new Benfica coach decides to do with him after an unsuccessful loan with Ligue 1 team Monaco. It's not all bad news, however. Standard Lieje's Oguchi Onyewu is a free agent after helping the Belgian club to two successive championships. Hammarby (Sweden) attacker and frequent US international Charlie Davies is being pursued by several as yet unnamed European teams. Beasley is another player that will most probably be moving this summer. He has had little input with Rangers and midfielder Maurice Edu has more than made up for it by becoming a dominant presence with the Glasgow club. Who could be on their way out of MLS this summer? Maybe Donovan, depending on his participation at international tournaments. Kljestan is another toss-up, as is Bornstein. Kenny Cooper may be getting a few looks as well. Let's keep dreaming for now. It's early. It's June 1st and qualifiers, Confederations Cup and Gold Cup are ahead.